Your source for updates and information regarding efforts to remember, restore and reconnect the Historic Columbia River Highway and State Trail – a world class adventure from Portland to The Dalles. March 21 from 10 a.m. to 2 p.m. in Mosier at the Mosier Community Center, located at 500 E 2nd Street. Historic Highway State Trail: Wyeth to Lindsey Creek construction update. Historic Highway State Trail: Remaining segments design update and the Oneonta Tunnel Restoration Project. Update on the U.S. 30 Cascade Avenue at Rand Road project in Hood River. Mosier Rock Creek Park Restoration site visit. The full agenda will be available online before the meeting. The newest three-miles of the Historic Columbia River Highway State Trail is set to open in late summer 2019. Construction on the segment connecting Wyeth State Park to the west with Lindsey Creek and onto Viento State Park to the east, has continued through the winter. Shaping the new Wyeth trailhead. Installing railings on the Summit Creek Viaduct and Gorton Creek Bridge. Installing stone masonry on the Lindsey Creek Bench Cut. With the completion of this segment of trail, we are closer than ever to fulfilling the decades-long vision of reconnecting the original “King of Roads,” the 73-mile continuous route through the Columbia River Gorge National Scenic Area. Trails and recreation areas still remain closed after the Eagle Creek Fire. Visit the U.S. Forest Service website to find maps and current conditions before setting out. Law enforcement officials — Multnomah County Sheriff and the Oregon State Police – may very well cite people with criminal trespass when they choose to enter a closed area.The Forest Service is also issuing trespass citations. Winter continues to bring us challenging weather. 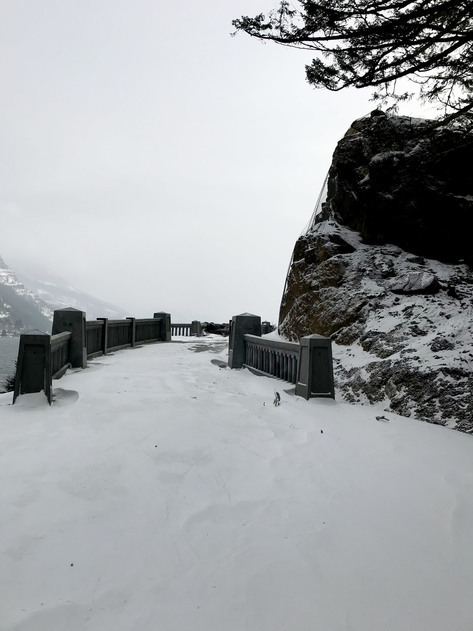 Cold and snowy weather coupled with the after-effects of the Eagle Creek Fire has been creating increased rockfall along the Historic Highway. ODOT anticipates continuing rockfall along the Highway continually monitors the roadway for the safety of the traveling public. Travelers should be aware of their surroundings and changing environments, and use caution when travelling in the Gorge during winter weather. Another landslide developed off Interstate 84 Exit 41 at Eagle Creek in February, following a December slide. This area was heavily damaged by the Eagle Creek Fire which burned vegetation, underbrush and tree roots that support the Columbia Gorge. Land and rock slides are anticipated with winter weather and heavy rain. For I-84 and Historic Highway closure information, visit TripCheck.com. In honor of Women’s History Month, ODOT would like to acknowledge the activism and efforts of past and current Historic Columbia River Highway Advisory Committee members. Current members Francie Royce and Judy Davis represent Wasco County and bring their love of the outdoors and passion for recreation in the Gorge to each meeting. Past women members of the committee include Lorna Stickel, Sharon Timko, Janice Newton, Sally Donovan, Barbara Briggs, Carolyn Woods, Diane McClay, Jenn Cairo, Julie Curtis, Mandy Cole, Karen Viehoever, and Kay Van Sickel. The Advisory Committee is not the only way in which women have contributed to the Historic Highway and the Columbia River Gorge National Scenic Area. Nancy Russell (1932-2008) was a driving force in creating the National Scenic Area in the 1980s and helped found the Friends of the Columbia Gorge, who continue her legacy of preservation today. 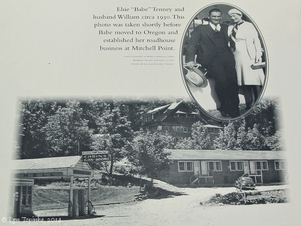 Between 1932 and 1944, Elsie “Babe” Tenney ran the Texaco Station, lunch counter, tourist court and the hunting lodge at Mitchell Point, and some sources note that former President Theodore Roosevelt came to hunt elk behind the lodge when he stayed as a guest. Another early visionary in the Gorge is Margaret “Bidy” Henderson, who opened the Crown Point Chalet in 1915, prior to the completion of the Historic Highway. The chalet attracted local and national dignitaries and Margaret was widely known for her hospitality and good food.